EPISODE ORIGINALLY BROADCAST: Saturday May ? 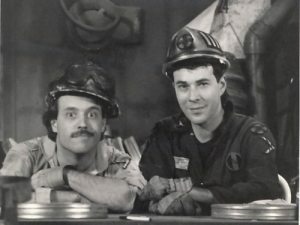 ?, 1987 from 10:30pm to 1:00 am. Exact date is still being debated. Any Vaulties with further information please feel free to contact me. EXTRAS: Every single nanosecond of this film is riff-worthy, so with the usual comedy sketches from the Film Vault Corps (“the few, the proud, the sarcastic”) added on plus commercials there was no time for an episode of a Republic or Columbia serial before the movie this time. Randy and Richard, our machine-gun toting Film Vault Technicians First Class were able to get to the movie quickly. 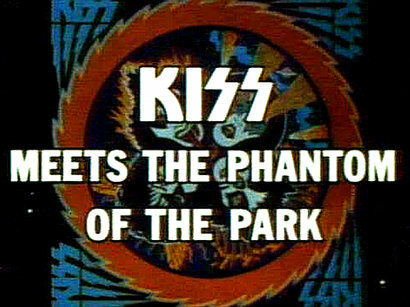 THE MOVIE: KISS MEETS THE PHANTOM OF THE PARK (1978) – Gene Simmons, Paul Stanley, Peter Criss and Ace Frehley stumble their way through this notoriously awful and unceasingly hilarious excuse for a movie. It’s like a feature-length Josie and the Pussycats cartoon but with KISS of all bands in the lead roles. The only thing missing from this movie is El Santo as the four members of KISS are depicted possessing super-powers … yes, SUPER-POWERS! Those super-powers do or do not emanate from their special talismen as the movie absurdly contradicts itself about this as well as about nearly everything else. Our super-powered Knights In Satan’s Service (as paniced parents were fooled into thinking KISS stood for) are performing at AN AMUSEMENT PARK (?) for three days because dammit, nothing says “family friendly” like these guys! The park is unnamed in the film but was really Magic Mountain. 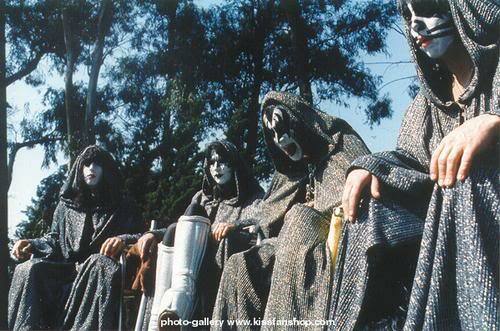 KISS dressed in wizard’s robes for the press conference where they stupidly announce to the world that their talismen are their Achilles Heel. The Phantom of the title is Dr Abner Devereaux (Anthony Zerbe), a mad scientist who creates the lifelike animatronic humanoids at the park (think of Disney’s Hall of Presidents but even lamer). Devereaux isn’t appreciated by the park’s ownership (including Carmine Caridi himself) but stays on at the park for some reason even though you’d think the CIA or somebody would pay him a lot more money to design his android duplicates of prominent figures just for them. Our dastardly villain clashes with KISS who defeat his robot ape-men and other constructs in the course of thwarting his ultimate goal: having android duplicates of KISS impersonate the real things during a concert and behave like violent thugs, which will supposedly disillusion their fans or … something. The Phantom seems to think it will be for the 70’s generation what the Vietnam War was for the 60’s generation. Well, he IS mad, don’t forget. The movie also features two villainous biker dudes called Chopper and Slime. Yes this WAS a Hanna-Barbera Production, thanks for asking! Paul Stanley – Starchild – can shoot energy beams out of his make-up encrusted eye and can even make those beams solid if he chooses. This lets him walk (kind of) along a solid beam of light in one of the most drop-dead funny instances of this movie’s dreadful special effects. Watch Gene shoot flame from … a floating location somewhere in the vicinity of his mouth. 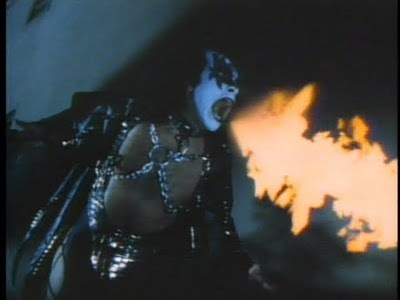 Gene Simmons – The Demon – can really shoot flames from his mouth according to this movie, but in a couple of instances this effect is rendered so poorly you can VERY easily see where the techies did their business (so to speak). Gene fares the worst of the band in this movie. The filmmakers distorted his voice with a chintzy reverb effect to try to make him sound spooky and add to his “demonic” air, but the end result is that you can barely understand a word he says. He also growls like an animal at times. Ace Frehley – Space Ace – is capable of teleportation, the only special effect that the makers of this telefilm rendered half-decently. On a sillier note Ace’s stunt double in fight scenes is clearly A BLACK GUY adding to the already considerable comic appeal of those scenes. Catman at his liveliest, dreaming about furballs and his litter box. 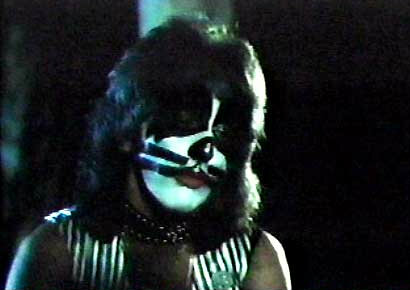 Peter Criss – Catman – has all the powers and abilities of a cat, but with only half the calories. I don’t even know what that means. 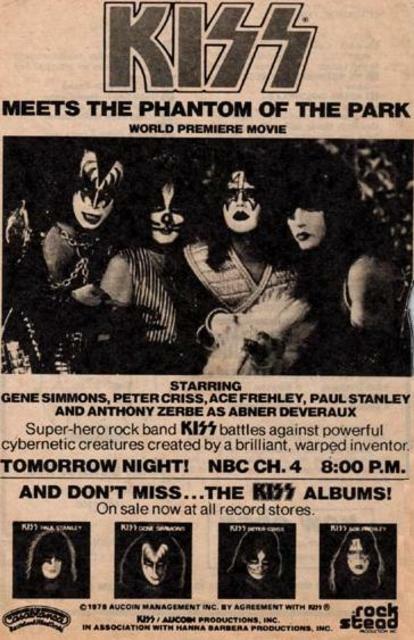 One of the legends about the production of this monstrosity claims that Criss (and/or other KISS members, depending on the version) delivered their lines so badly they had to be redubbed by cheap actors. Then he (or they) threw fits at being redubbed and looped themselves in post-production yet came out sounding even dopier. After KISS collectively destroy their robot duplicates they prevent their fans from trashing the amusement park by soothing their savage breasts. They play Rock and Roll All Night which does the trick. Dr Devereaux has gotten his by – I swear – RAPIDLY AGING for no apparent reason. He’s nearly comatose and has long grey Howard Hughes hair. No explanation is ever given for this. It’s that kind of movie. The story goes that this movie was pitched by describing it as “Star Wars Meets A Hard Day’s Night“. Unfortunately it’s not even Birdemic meets Showgirls. The Bee Gees must feel MUCH better about the film Sgt Pepper’s Lonely Hearts Club Band whenever they think of KISS Meets the Phantom of the Park. Very funny review! This show sounds better than anything Mike Nelson ever did! lol I was a KISS fan and I’d love to have seen Randy and Richard show this! Glad to hear it ! Thanks! To funny! They sound like more fun than MST3K! They were much less politically correct, that’s for sure. I am in love with the fact that they riffed on this movie! I WANT A TIME MACHINE SO I CAN GO BACK AND WATCH THIS SHOW! i really think he only made it bc of his condition n the sad song, just like the commercials trying to make you help the hungry n sick and they didn’t want to be to ones to say no bc that performance? wasn’t good?